When: Friday, May 6th from 5-9pm. Where: Hatch Art House of course! 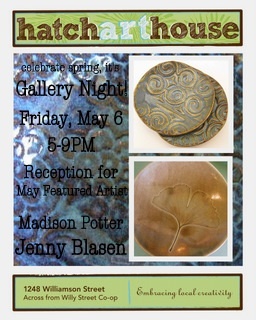 Why: To check out and support over 35 local Wisconsin artists along with May featured artist Jenny Blasen. We’ll be celebrating spring with Sangria! Yum…. Jenny Blasen, a Madison potter, is the May featured artist. She’s been very busy making new works! She has a focus on functional pottery but also enjoy making ceramic earrings and buttons.